Every now and again, you come across a game that changes everything. I have just played that game on the Playstation. It’s called Kung-Fu Live . And it is the best exercise game I have played on the Playstation 3 to date. In fact, it ranks among the best fitness game I’ve played on any system. And the strangest thing of all is that it’s not a $60 game from a big name company like Electronic Arts or THQ or Ubisoft. It’s from a little studio called Virtual Air Guitar company, who made it available for download on the Playstation Network for $14.99. That’s right, $14.99. The best way I can describe Kung Fu Live is that it’s a fighting game like Street Fighter or Mortal Kombat. Only instead of using a game controller, you use your body. That’s right, just your body. Virtual Air Guitar has brilliantly brought Kinect-like functionality to the PS3. You only need the Playstation Eye camera–you don’t need your Dualshock controller nor even the Move controllers. You kick and your on-screen character kicks. You punch, and your on-screen character punches. Oh yes, about your on-screen character. It’s YOU. That’s right, not an avatar, not a cartoon version of you, but your actual real-time video image that’s visible on the screen, interacting with the comic book enemies that are coming at you at all sides. Before you begin play you need to set up the system to your own room and lighting conditions. You see a video image of yourself and you need to select from some options to try to get the image so that your own image is clear, but any images in the background are blocked out. There are four pre-defined options you can choose from, or you can go into advanced mode and tweak different settings until your image is as clean as possible. As with the Kinect, you can select menu items by pointing to them on the screen–no controller necessary. I should say that because this is very early technology, it’ll take some time to get your image right, and even then there will be glitches (for example, imperfections and noise in your image or background objects coming through). This is understandable, given that they’re trying something new that’s never been done before on a system that wasn’t designed for it (which is probably why they opted to release the game on PSN first). For best results the lighting in your room needs to be perfect. I had no problems playing during the day with natural sunlight coming into the room; playing at night was a little more difficult, I had to adjust the different lamps in my room to try to get it right. For best results, play against a white wall and wear dark clothes (or vice-versa). If you’re wearing dark clothes, clear away any similarly-colored furniture or fixtures behind you. It might take a little effort, but it’s worth it. Once you have your video image set, that’s where the fun begins. As the game starts, the screen zooms in and lets you read through the pages of a beautifully designed and illustrated comic book. You’re literally the main character in the comic book. You follow a story of a young man who’s on his first day in a comic book store. In the first “Chapter”, after the comic book pages conclude you’re brought to a tutorial where you learn how to fight. The moves are very intuitive. To punch to the left or right, you punch. To kick to the left or right, you kick. You can move your onscreen character forward by either punching in or slightly moving your body in that direction. To jump, you jump. To do a flip, you jump but angle your body forward or backward. As you progress through the game, there are other more complex moves, all of which are still very intuitive. A “power punch” can be done by punching with both fists. A “slam” can be done by jumping up and the pounding the ground with your fists. You can even hurl lighting by raising a leg and holding your arms up! Again, as you do it in real life, you see your actual image doing it in the game. When you finish the tutorial you’re brought back to Chapter 2. In Chapter 2, the comic book pages show that character is closing up the comic book store and is attacked by a gang who’s after something that’s in the store. After this, you’re brought to a full scene in the comic book where you have to defeat each of your attackers using all the moves you learned in Chapter 1. As with traditional fighting games, a gauge will show you how much health you have versus your attackers. The game gets progressively harder as you move through it, but again, I always felt in control. As I got more confident, I’d unleash new attacks like combo moves and air attacks and punching and kicking high and low. The story continues through more chapters. I didn’t want to stop playing, the only thing that stopped me was that I was exhausted! Is the game a workout? I’ll say it is! I was kicking and punching opponents left and right and having a grand old time. And the game was surprisingly competitive, but never once did I feel I wasn’t in full control (I can’t even say that all the time with “real” fighting games that use controllers). And when each round was finished, I was sweating and panting as if I’d just gotten out of a real street fight! The game is incredibly creative and the developers clearly have a very, very good sense of humor. One of my most favorite features of the game came as a surprise to me. The game asked me to “pose” in various ways–an outline of a body would appear on the screen and I’d have to match it. For example, sometimes you need to pose with your arms stretched out, sometimes you need to get closer to the camera for a closeup, and so on. I realized later while watching the “comic book pages” that they actually included my image WITHIN the comic book pages, so I was literally a part of the story, and the way that your images are used are genius–when I first saw them I couldn’t stop laughing. Again, it’s a use of innovative creativity that makes those “hey look at how funny you look” videos after Kinect games look almost passe. This game easily catapults to #1 on my list of the top Playstation 3 Fitness Games. I would say it is a must-have if you’re a fan of fighting games and want to see what the future holds for innovative, creative game design. Again, go in with the right expectations–the lighting issues can be challenging and even frustrating at times, but the overall concept and innovation makes it all worth it. The best analogy I can make, and I don’t think I’m being melodramatic here, is that this is sort of like one of Thomas Edison’s first movies. Today, we look back at it as quaint and imperfect, but without those early efforts the motion picture industry would never have started. 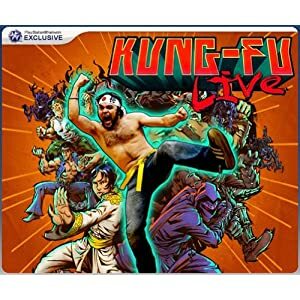 I suspect ten years from now people will look back at Kung Fu Live and point back to it as ushering a whole new way to think about video games. If I were a big time game manufacturer, I’d be keeping a close eye on the folks at Virtual Air Guitar. The easiest way to get it is to purchase Kung Fu Live an Online Game Code from Amazon . Just make the purchase from Amazon. You’ll get a code which you can enter in the Playstation Store (click the “Redeem Codes” icon at the top of the screen). Your download will start. The total size is about 874 MB, so it goes quickly. Looking back at some of the early reviews of this game, a lot of reviewers in the games press panned it. But I think time has vindicated the game–while most reviewers game it a rating of 3 or 4 out of 10, those very same sites’ users have overwhelmingly rated it an average of 7-9. To use another analogy, I suspect that the game reviewers didn’t have time nor patience to configure their lighting properly, and then took it out on the game. But when you take the time to set it up right, you’re in for a treat. I’ve often said that the mark of a great fitness video game is being so fun that you don’t want to stop playing, even if you’re perspiring, panting, and exhausted. Kung Fu Live is one of those games. 5 out of 5 stars. This one is a winner. I like Kung Fu Live alot. Good workout. Hopefully the follow up to this game on xbox will come out on ps3 as well. Here’s a vid of the hard level on kung fu live.